These are some of Joel’s most used and loved drum samples from his career mixing. Joel is best known for his work mixing artists like Miyavi, Machine Head, Monuments, Vinyl Theatre, Attila, blessthefall, Righteous Vendetta, Anakin and many more. This DRUMSHOTZ pack is focused towards the rock and metal genres. 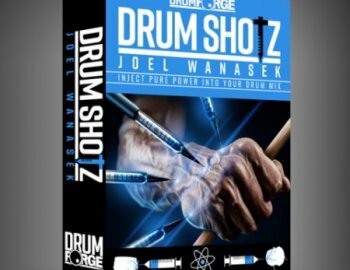 Mix and match your favorite sample libraries or raw drum recordings with the Joel Wanasek signature DRUMSHOTZ today and discover a fresh take on your sound. One Shot signature sample collection from producer/mixer Joel Wanasek. 36 samples total in 44.1, 24 bit format. For use with your favorite triggering program or in any DAW. 5 Kick Direct, 5 Kick Room samples, and 1 Kick Sub sample. 5 Snare Direct and 8 Snare Room samples. 2 Tom sets with 6 Tom Direct Samples with 6 Room samples. INJECT YOUR DRUM MIXES WITH STEROIDS. One shot samples are powerful weapons for enhancing your drum mixes as they provide you with the extra punch and consistency you need to cut through any mix. Many professional mixers have highly coveted collections of one shot drum samples which are refined over years of mixing. This is how they achieve their signature drum sound no matter the quality of the source recording. DRUMSHOTZ is a series of highly coveted drum samples from professional mixers to enhance, blend, or replace drum sounds in your mixes. Inject heavy gainz into your drum mixes today with DRUMSHOTZ and experience a whole new level of punch, impact, and power.